Kellogg Community College is hoping to cast up to 30 actors for the College’s spring musical “Zombie Prom” during open auditions this month in Battle Creek. 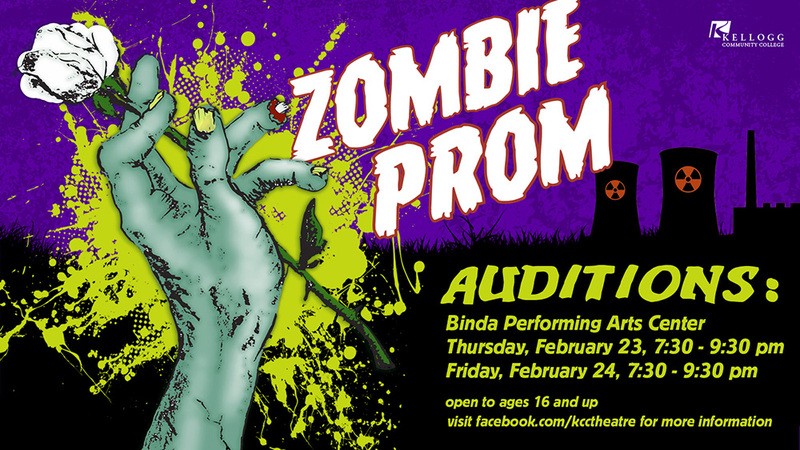 Auditions for “Zombie Prom” are open to the public as well as to students and will be held from 7:30 to 9:30 p.m. Thursday and Friday, Feb. 23 and 24, at the Binda Performing Arts Center on campus at 450 North Ave. The musical opened Off-Broadway in the mid-1990s and was later adapted into a short film. KCC’s production will run for five showings, including performances at 7:30 p.m. Thursday and Friday, April 20 and 21; at 3 and 7:30 p.m. Saturday, April 22; and at 3 p.m. Sunday, April 23. “Zombie Prom” roles are open to all actors ages 16 and up. Actors interested in auditioning for the musical may choose to audition on either date and should wear clothes and shoes comfortable enough to move and dance in. Reading from scenes in the script. Time will be provided to practice before reading in front of others. There is no guarantee every actor will get to read for every part, but all will be considered for every part based on what they show in their auditions. More information about auditions, including character descriptions for each role, is available on the KCC Theatre Facebook page at www.facebook.com/kcctheatre. Actors cast in “Zombie Prom” must be available for rehearsals from 7 to 9:30 p.m. for at least four weeknights each week from early March through the May 23. There will also be a mandatory daylong rehearsal on Saturday, April 15. The cast must also be available for all “Zombie Prom” performances April 20 through 23. For individuals interested in being involved in the production but with a more limited schedule, there are also spaces available in a backstage capacity with a less extensive scheduling requirement. For more information about “Zombie Prom” auditions or the KCC production in general, contact KCC Theatre professor and “Zombie Prom” director Brad Poer at poerb@kellogg.edu.